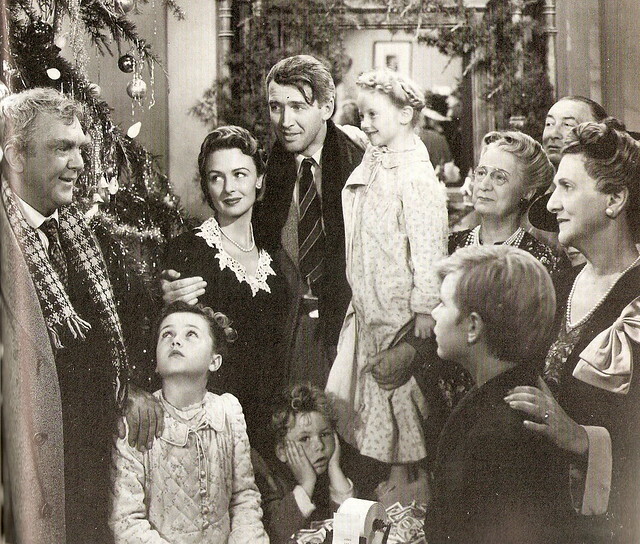 Our look at classic Christmas songs from Old Hollywood films continues with James Stewart, Donna Reed, Karolyn Grimes and the cast of It's a Wonderful Life (1946) singing Auld Lang Syne. The songs starts at the 1:00 mark. Auld Lang Syne is heard around the world on New Year's Eve, but the song is a traditional ballad rooted in ancient Scotland. The cast of It's a Wonderful Life gather around the Christmas Tree. Poet Robert Burns (1759-1796) is the national bard of Scotland. He wrote many poems that are part of Scotland's national heritage (Tam O'Shanter, Scots Wha Hae, To a Mouse), but he was also something of an amateur anthropologist. Burns frequently traveled the country gathering old tales and songs. It appears that Auld Lang Syne was an ancient Scots drinking song that Burns reworked. In 1788, Burns sent a copy of Auld Lang Syne to the Scots Musical Museum with this note: "The following song, an old song, which has never been in print, nor even in manuscript until I took it down from an old man." Auld Lang Syne means days gone by and the song is an invitation to the listener to sit down and have a drink and reminisce about old times and old friends. 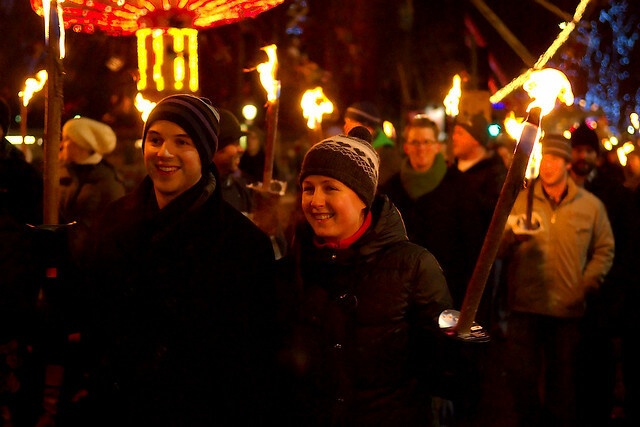 Auld Lang Syne is traditionally sung at Hogmanay celebrations in Scotland, like this torchlight procession in 2009 in Edinburgh. Auld Lang Syne quickly became popular in Scotland, especially during the annual Hogmanay celebrations. Hogmanay is the celebration of the New Year's holiday in the Scots manner, and Hogmanay, rather than Christmas, is the primary winter celebration in that country. Hogmanay customs include fireworks and torchlight processions, but one of the most beloved rituals is linking arms and singing Auld Lang Syne when the clock strikes midnight on Jan. 1. The video below shows revelers in Edinburgh ringing in 2009 with a rousing rendition of Auld Lang Syne. Scottish immigrants to the New World took their Hogmanay traditions with them and Auld Lang Syne became a popular standard on New Year's Eve. Bandleader Guy Lombardo and His Royal Canadians popularized Auld Lang Syne through their annual New Year's Eve broadcasts, which aired on radio and television from 1929-1976. Lombardo's version of Auld Lang Syne is still played every year during the celebrations in Times Square. The clip below shows Lombardo ringing in 1958 in his signature smooth style. Of course, Auld Lang Syne became embedded in American pop culture thanks to its inclusion in the heart-warming finale of director Frank Capra's Christmas classic It's a Wonderful Life (clip above). The citizens of Bedford Falls, including legendary character actor Ward Bond on the accordion, serenade down-on-his-luck George Bailey (James Stewart) with Auld Lang Syne while they donate $8,000 to save his failing building and loan company. 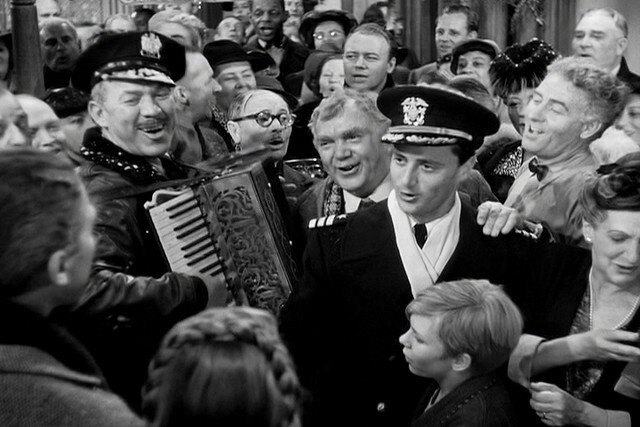 The citizens of Bedford Falls serenade George Bailey with Auld Lang Syne. Auld Lang Syne has also been embraced by many cultures throughout the world. One of the most recognizable tunes in India and Bangladesh is Purano Shei Diner Kotha (Memories of the Good Old Days), a Bengali version of Auld Lang Syne written by Nobel laureate Rabindranath Tagore. In Thailand, a version of Auld Lang Syne called Samakkhi Chumum (Together in Unity) is a popular anthem at national holidays and sporting events. There are two versions of Auld Lang Syne in Japanese and the song is customarily played at closing time in department stores as a polite way to signal customers that it's time to leave (clip below). Go here for more of our Christmas songs series.